Which famous financial market strategist wrote these words? Actually it was me – written 18 years ago for the 2000 mid-year “Steve’s Perspective.” At that time, it had been over a decade since the last bear market so it made sense to consider what is a bear market, what causes a bear market and how do you prepare for one. Since the last bear market ended in March 2009, let’s revisit those questions. 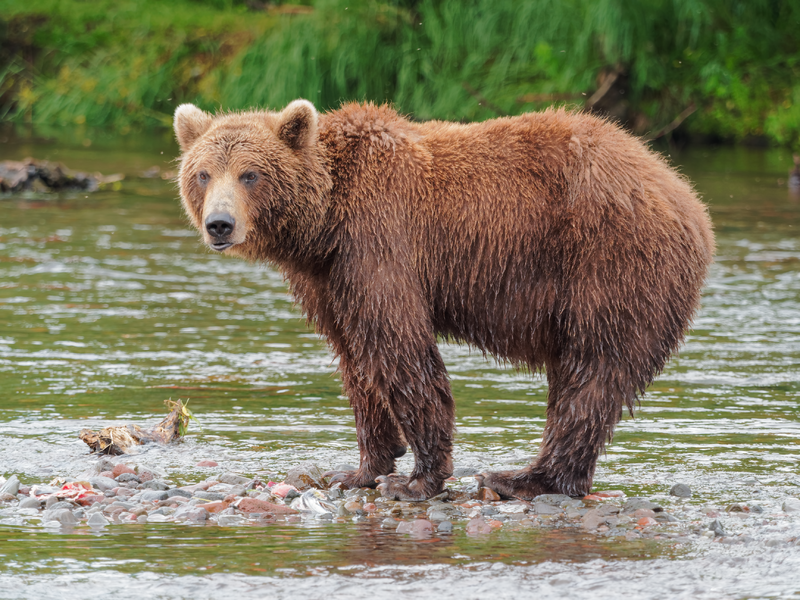 The dreaded bear market is so named because when a bear attacks, it stands on its hind legs and paws downward. Technically, an equity bear market is a decline of over 20% of a stock market index like the S&P 500 or Dow Jones Industrial Average from its high point. From an emotional standpoint, the euphoria of watching your investment values increase on a quarterly basis is replaced with the pessimism and frustration of seeing values decline. Hope is replaced with fear. 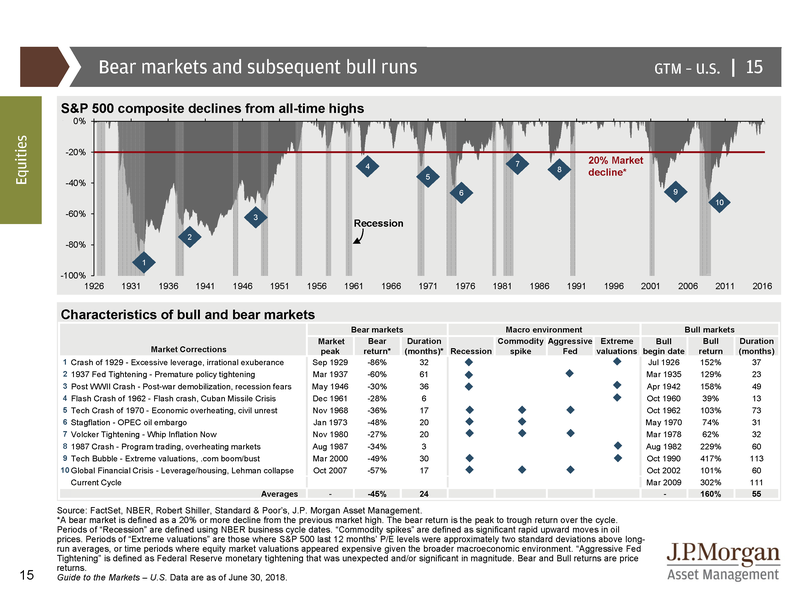 The following graph provides a historical view of the past 10 bear markets. It starts with the 1929 Crash and ends with the Global Financial Crisis in 2009. Excessive leverage – remember 2009 when people were taking out large mortgages with little income or assets. Extreme stock market valuations – the 2000 Dot.com bust where companies with no earnings were being priced at ridiculous levels. Commodity spikes – the gas lines in the 1970’s with skyrocketing oil prices. Aggressive Federal Reserve – tightening of credit leading to higher interest rates. My first mortgage rate in 1984 was 12.5% – that’s makes it hard to afford a home. How do you prepare for a bear market? Do you diversify and hide your money in more than one mattress? We don’t think so. As stated above by Mr. Marks, guessing when a bear market is going to occur is a losing proposition. An investment portfolio that is well diversified is the best way to protect downside risk, while still having the opportunity to participate in upside returns. We also mitigate downside risk through the use of active equity managers. While investing in passive index funds or ETF’s allow investors to participate in market returns in a low cost manner, these investments lose as much as the index they are designed to track in a bear market. Instead, we focus on managers with a historical track record of effectively managing downside risk. It is vital to remember that only a portion of your portfolio is invested in stocks that will be impacted during a bear market. That portion is determined by both your specific situation and your risk tolerance. By incorporating the use of tactical equity managers (funds that vary their weightings in stocks, bond, and cash), we believe we have a group of managers that can actually take advantage of opportunities that bear markets present. In addition, we have used different alternative strategies that are minimally impacted by equity market declines. We are also disciplined in periodically rebalancing your portfolio which results in the proverbial “selling high and buying low.” Finally, for those clients who are taking income distributions from their portfolios, we are using this rebalancing process to make sure you have at least a year of distributions set aside and not subject to equity market risk. At the beginning of 2018, The Legacy Perspective stated that we would not be surprised by a market correction (10% drop in the equity markets). Little did we know that a correction would begin on January 26th. Please understand this Legacy Perspective is not saying a bear market is imminent. However, at some point, a bear market will occur again, and yet know that your portfolio is allocated in a manner to safeguard your financial independence.